Beautifully engraved certificate from DigitalRooster.com. This historic document has an ornate border around it with the company's name on top center. This item has the printed signatures of the Company’s President and Secretary. 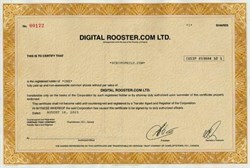 Digital Rooster.com Inc. is an Internet e-commerce adult entertainment destination providing online upscale adult content. The Company also operates its own destination web sites. The Company's goals are to brand its web sites as premier adult entertainment destinations and build a significant worldwide community of loyal clients who enjoy its unique entertainment.